Infantile hemangiomas (IHs) are the most common benign vascular tumor of infancy. There are special considerations in IHs, like the beard-distribution hemangiomas, in which preauricular areas, chin, neck, and lower lip are involved. In contrast, cleft lip and palate (CLP) is the most common congenital malformation of the craniofacial region. Although estimates vary, approximately 5% of infants develop a hemangioma during the 1st year of life. In contrast, CLP is present in about 1 in 700 of newborns. Even though they are common enough, there is no evidence reporting a patient with both entities simultaneously. 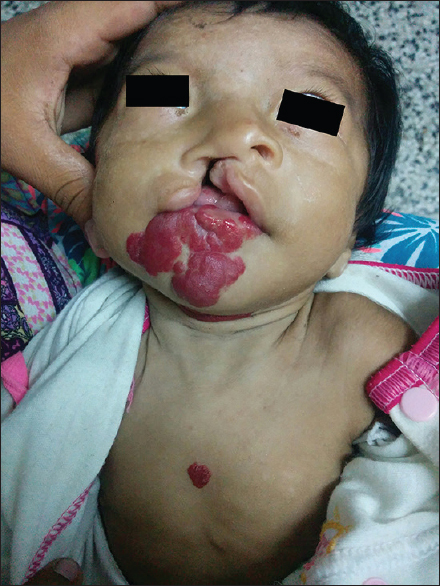 A 3-month-old female baby was presented by the mother to the Craniofacial Anomalies and Cleft Unit of University Hospital of Maracaibo, Venezuela, in June 2018, with a complaint of CLP and multiple lesions in the orofacial region since birth. The baby was the parent's second child without a history of consanguineous marriage. The patient presented with right complete unilateral cleft lip and Type III cleft palate. Likewise, red plaque-like lesions with moderate elevation were observed in the right temple, right ear lobe and preauricular regions, lower lip, chin, neck, and chest [Figure 1] and [Figure 2]. These clinical findings and the clinical history lead to the diagnosis of IH in a beard distribution associated with CLP, and thus, magnetic resonance imaging, ultrasound, or biopsy was not performed. An evaluation performed by the otolaryngologist rule out the presence of lesions in the airway. Genetic evaluation did not discern an underlying syndrome, and the vascular anomalies team evaluated the patient and found no additional findings of PHACE syndrome (posterior fossa anomalies, haemangiomas, arterial anomalies, coarctation of the aorta and cardiac defects, eye abnormalities, sternal clefting and supraumbilical raph). This study was approved by the University Hospital of Maracaibo International Review Board, and all participants signed informed consent agreement. IHs are proliferative vascular tumors consisting of endothelial cells which can occur anywhere in the body. In most cases, IHs are not present at birth, but then develop in the 1st month of life. The IH first enters a proliferation phase and rapidly grows for 3–5 months. This is followed by a prolonged involution phase with spontaneous regression over the course of years. The treatment of IHs is always individualized to the specific lesion as well as to the patient. Observation is frequently selected in the majority of IHs especially if the hemangioma is at the beginning of the proliferation phase. Early intervention should be pursued in some hemangiomas, depending on growth rate, extent, location, and complications. In our case, after a discussion with the cardiovascular surgery service, we decided not to apply any treatment on the hemangioma, given that there is a lack of functional alterations and the tendency of these lesions to involute. Applying propranolol could be considered in case the lesions present a more aggressive behavior or if they do not decrease in size in the expected period. For the management of the CLP, we started the protocol used in our service, wich consists of an initial orthopedic phase, with the use of nasoalveolar molding and orthosis splints. Subsequently, once the patient is at least 3 months of age, a primary surgical phase will be initiated, where a primary cheilorhinoplasty using a modified Millard Technique will be performed, along with two-plane local flaps to cover the nasoalveolar cleft and a vomer flap to cover the nasal floor of the primary palate. Later on, when the patient is at least 9 months old, a secondary surgical phase will be performed, consisting of a primary palatoplasty and velopharyngeal reconstruction. Given that the hemangiomas are not involved in the clefts, the postoperative healing should not be compromised by these lesions. To the authors' knowledge, there is no evidence in the literature that reports both pathologies simultaneously, nor any syndromes that may associate these entities, as presented in our case. Fowella C. Monaghanb A, Nishikawaca H. Infantile haemangiomas of the head and neck: Current concepts in management. A review. Br J Oral Maxillofac Surg 2016;54:488-95. Holland KE, Drolet BA. Approach to the patient with an infantile hemangioma. Dermatol Clin 2013;31:289-301. Díaz Casado GH, Díaz Grávalos GJ. Orofacial closure defects: Cleft lip and palate. A literature review. Semergen 2013;39:267-71. Adams DM, Ricci KW. Infantile hemangiomas in the head and neck region. Otolaryngol Clin North Am 2018;51:77-87. Fowell C, Monaghan A, Nishikawa H. Infantile haemangiomas of the head and neck: Current concepts in management. Br J Oral Maxillofac Surg 2016;54:488-95. McCormick AA, Tarchichi T, Azbell C, Grunwaldt L, Jabbour N. Subglottic hemangioma: Understanding the association with facial segmental hemangioma in a beard distribution. Int J Pediatr Otorhinolaryngol 2018;113:34-7. Piram M, Hadj-Rabia S, Boccara O, Couloigner V, Hamel-Teillac D, Bodemer C, et al. Beard infantile hemangioma and subglottic involvement: Are median pattern and telangiectatic aspect the clue? J Eur Acad Dermatol Venereol 2016;30:2056-9. Baselga Torres E, Bernabéu Wittel J, van Esso Arbolave DL, Febrer Bosch MI, Carrasco Sanz Á, de Lucas Laguna R, et al. Spanish consensus on infantile haemangioma. An Pediatr (Barc) 2016;85:256-65. Neri I, Piccolo V, Russo T, Bianchi A, Patrizi A. Congenital primarily ulcerated hemangioma mimicking cleft lip. J Pediatr 2013;162:882.e1. Berenguer B, González M, Marín, Tomás Palacios E. Rapidly involuting congenital hemangioma (RICH) that simulates a minimal cleft lip. Cir Pediatr 2010;23:130-3.